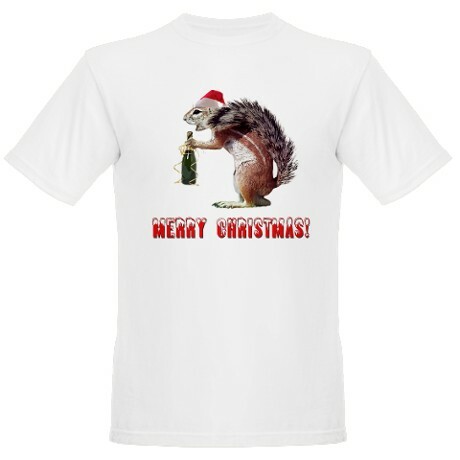 A squirrel shirt with a rude kind of twist, but nevertheless funny, this champagne-drinking rodent wants to wish you a "Merry Christmas". Available in 21 different styles, one of which is a women's shirt. You can buy this shirt here. While some may find this to be an offensive shirt, it's hard to go wrong with a champagne-drinking squirrel. Or chipmunk. Just imagine all the holiday cheer in his little furry gullet. I'm sure he can hardly contain it. The Santa hat on the squirrel's head just adds to the charm. Spread the holiday love -- and laughter -- with this slightly rude tee shirt.